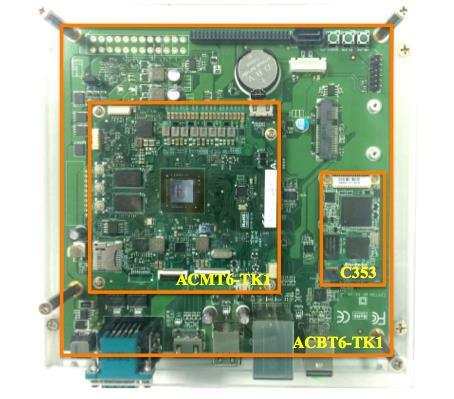 With the new product release of Tegra K1 Type-6 carrier board (EK611-AA), AVerMedia will be presenting her complete Embedded Tegra K1 Solution, as shown in the photo, which is composed of AVerMedia C353 (HDMI/VGA Mini-PCIe frame grabber on NVIDIA Tegra K1 platform), EK611-11 (Tegra K1 COM Express Compact Type-6 module), and EK611-AA (Tegra K1 Type-6 carrier board with 2 Mini PCI Express slots) in COMPUTEX Taipei, from 05/31/2016 to 06/03/2016. On this embedded solution, AVerMedia will demonstrate the applications of image recognition, developed by integrating OpenCV functionality. AVerMedia Embedded Tegra K1 Solution is a high performance Tegra system with Mini-ITX form factors, which can be equipped by AVerMedia HDMI/VGA/HD-SDI Mini-PCIe frame grabbers. It is capable of running sophisticated audio and HD video capturing, post processing, encoding, and streaming. For those embedded solution developers who wants to free up from the constraint of NVIDIA Tegra K1 platform, which currently can only acquire video feeds through MIPI-CSI or USB interfaces, AVerMedia Embedded Tegra K1 Solution can enable the application developers to acquire HD video feeds from many other kinds of cameras and/or video devices through HDMI, VGA, and HD-SDI interfaces. This unique feature makes AVerMedia Embedded Tegra K1 Solution suitable for the applications of robotics, UAV (i.e. drone), medical image, UGV, AOI, and other video-enabled equipment for automation, AI, and deep learning. On her Embedded Tegra K1 Solution, AVerMedia also offers software design service of Linux BSP, driver, SDK for audio and video codec, post-processing, and streaming, as well as computer vision and CUDA program optimization. These supports can greatly help the embedded solution developers to integrate the supercomputing power and extraordinary energy efficiency of NVIDIA Tegra K1. AVerMedia is now developing a brand new Tegra X1 carrier board with Mini PCI Express slots and other unique functionality, which can work with NVIDIA Jetson Tegra X1 module for embedded video applications. Should you want to get early engagement with our work, you are welcome to send us an email @ Liwen.Liu@avermedia.com.